The Louvre is particularly rich in major works by vigee Le Brun. In addition five panel portraits which unfortunately could not be lent to this exhibition, and the artises morceau de reception (cat. no. 9), the museum also houses the two finest examples of her graphic art, the present sheet and the so-called portrait of Mlle de Bonneuil (cat. no. 22), both dating from 1785. 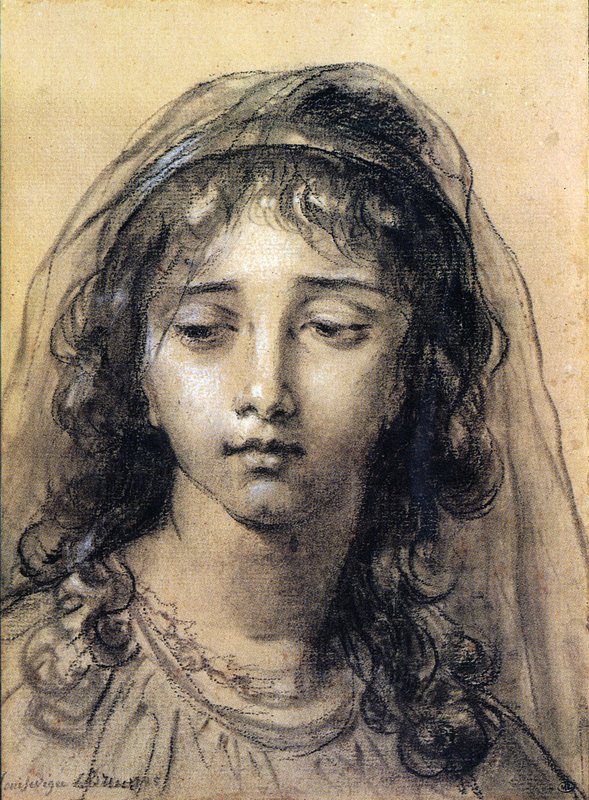 In this sensitive drawing, Mme Le Brun has expressed her own conception of ideal feminine beauty. Quite often the features of her models are made to conform to this "type." A case could be made that the true subject of the drawing is "Candeur" (Innocence). The eyes, lowered and turned away from the observer, are slightly melancholic in their expression. The countenance of the young bride in Greuze's Marriage Contract of 1761 (Musee du Louvre) is akin in its emotional content to this head of an adolescent girl; however, no presumption is made here that the one influenced the other. Once again, however, it was Greuze who established a precedent which set the tone for this kind of head study. PROVENANCE: Sold Paris, Constantin et Paillet fils, Vente de feu J. B.P. Le Brun, May 23, 1814, lot 243. SELECTED EXHIBITIONS: Paris, Hotel des Negociants, Femmes peintres du XVIIIE siecle, May 14-june 6, 1926, no. 8 (of Drawings); Paris, Mus6e du Louvre, Cabinet des Dessins, Portraits dans le dessin frangais du XVIIIE siecle, February-April 1958, no. 58. REFERENCES: Illus. in A. Blum, 1919, facing p. 30 (drawing reproduced as if it were a sanguine); D. Sutton, French Drawings of the Eighteenth Century, London, 1949, illus. p. 58, pl. XLVI.